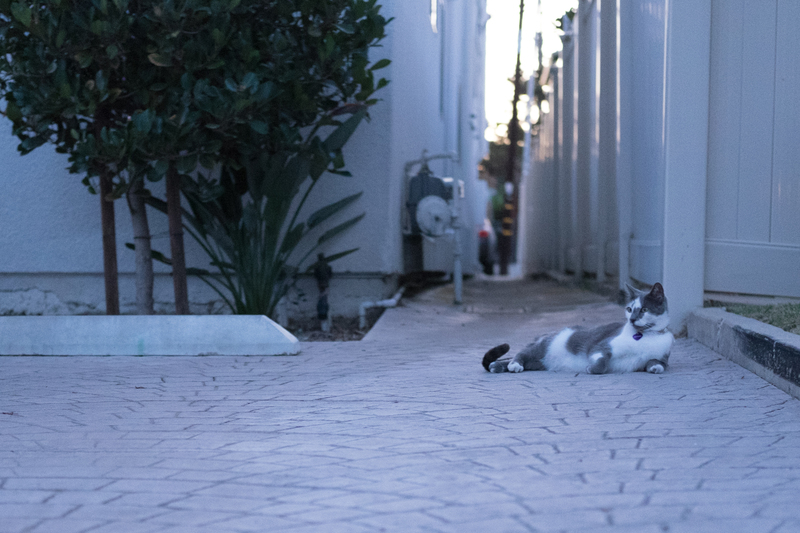 There nights ago, I spotted a neighborhood feline that’s new to me, lounging in an apartment building parking lot on Campus near Meade. While the kitty goes there often, she apparently resides in a house behind. I nickname her Jumper, because she repeatedly leaped in the air chasing something—presumably bugs. Hehe. Naturally, I missed capturing the activity. The Featured Image is the last of 20. Lying down, Jumper presents a good view of her coloring. I captured the moment at 6:12 p.m. PDT—about 20 minutes after sunset—on Nov. 3, 2016. Before embarking on the photo Cat Walk, I attached the Fujinon XF35mmF2 R WR lens to the Fuji X-T1, anticipating low-light shooting. I edited from RAW in Adobe Photoshop Lightroom—cropping; changing the temperature from 5,000 to 5,600; and tweaking exposure, highlights, and blacks. Vitals: f/2, ISO 2500, 1/60 sec, 35mm. How this series has grown. Other featured felines: Scruffy, Roly Poly, Woo, Skull, Biscuit, The Colonel, White, Chipper, Frisky, Stretch, Needy, Farfisa, Mates, Hunter, Pee-Pee, Blue, Blue Too, Bonded Pair, Patience, and Fess.